To make the salted caramel sauce: Pour sugar evenly into the bottom of a heavy 2 to 3-quart saucepan and heat over medium-high heat. Start whisking sugar once it begins to melt. Whisk until all the sugar is melted, then stop whisking. When the sugar turns to a dark amber-colored liquid, carefully add butter and whisk until butter is fully incorporated. Remove pan from heat. Slowly pour heavy cream into caramel while whisking. Add salt and stir to combine. Cool caramel 10 minutes in pan, then pour into a glass jar and cool completely before storing (can be stored in fridge for up to 1 month). Meanwhile, combine cream cheese, powdered sugar, vanilla and thyme leaves in a small bowl. Spread mixture evenly on baguette slices; top half of the slices with sliced strawberries, then top with remaining baguette slices. Heat a large griddle or skillet over medium heat. Add butter to pan; swirl to coat. Place sandwiches on griddle and cook until golden brown, about 4-5 minutes. Flip and cook until golden brown. Transfer sandwiches to serving plates; drizzle with salted caramel sauce and serve immediately. Get excited, people: I’ve found a way to eat grilled cheese for DESSERT. 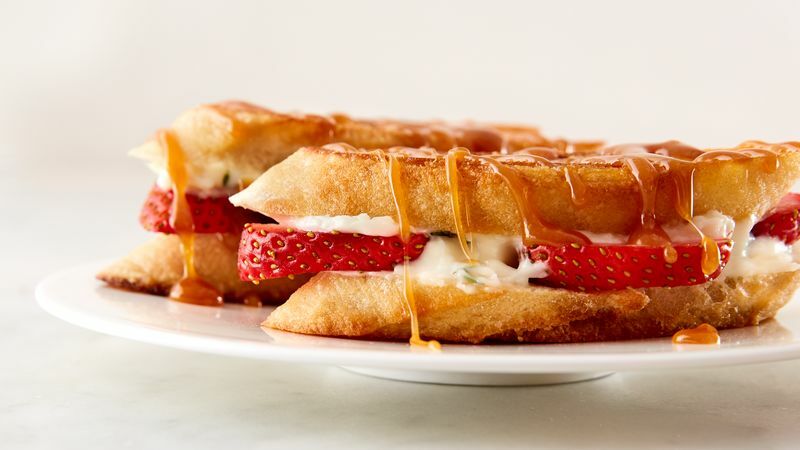 It’s called Strawberry Grilled Cheese with Salted Caramel, and it’s going to rock your socks! Don’t get me wrong: I loooove savory grilled cheese. Basically, if it’s cheese and it’s melty and it’s between two pieces of buttered and grilled bread, I’M THERE. This recipe definitely still fits the bill, but instead of savory ingredients we’ve used sweet ones, like cream cheese and strawberries. And – in case I didn’t make it clear already… Salted. Caramel. Sauce. All drizzled on top. I feel like we need to slow clap for that. Anyway, now that I’ve got you sufficiently drooling everywhere, let’s get to the good stuff! Round up your ingredients for the homemade salted caramel sauce (don’t worry, it’s the easiest thing to make and the tastiest thing to…well, taste) and for the sandwiches. Make the caramel sauce per the recipe directions (I would have photos of the exact steps, but as anyone who has made caramel sauce from scratch knows, that would require three or six arms). Let the sauce cool for a few minutes while you assemble the sammiches. Combine cream cheese, powdered sugar, vanilla and fresh thyme leaves (yes, thyme… it’s strangely delicious) and spread the mixture on top of baguette slices. Top half of the slices with fresh strawberry slices (there are a lot of slices), then top with the remaining baguette slices. Heat a griddle over medium heat and grease with butter. Cook the sandwiches until they’re golden brown and crispy on both sides, about four to five minutes each side. GLORIOUS DAY, that looks scrumptious. But we’re not done yet! Drizzle that with some salted caramel sauce. Now we’re good to go. You know what? Let’s do that slow clap again. Stephanie (aka Girl Versus Dough) wants to dunk her face in this. But seriously. Check out Stephanie’s Tablespoon member profile and keep checking back for her own personal recipes on Tablespoon!